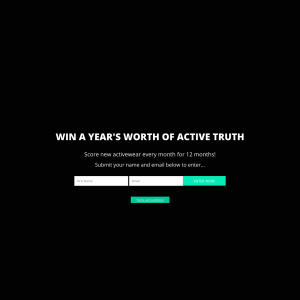 Win new Active Truth products every month for a year (12 in total). Start date: 30 November, 2018. End date: midnight AEST 31 December, 2018.
referral will be marked as an entry in the contest. receive (1) additional entry into the random draw. on the 1st of every month). The product will be selected by Active Truth. Winner will be chosen at random using online generator. 6. Entrants' personal information will be collected by Active Truth. its products, including contacting the entrant electronically. with the Privacy Act 1988 (Cth). winner will forfeit the prize in whole and no substitute will be offered.